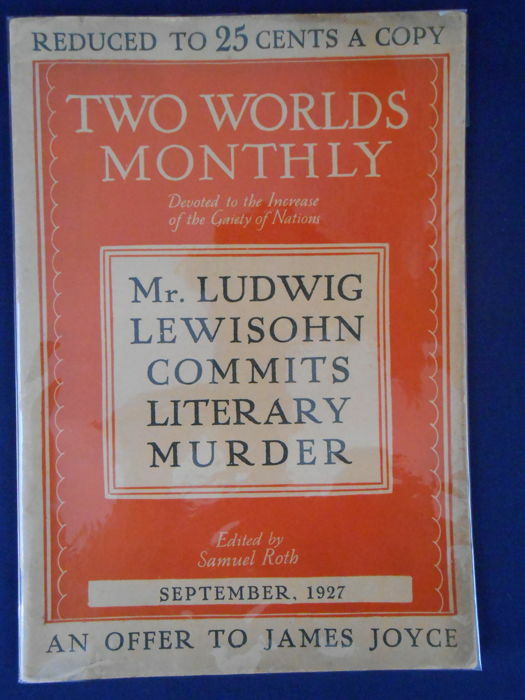 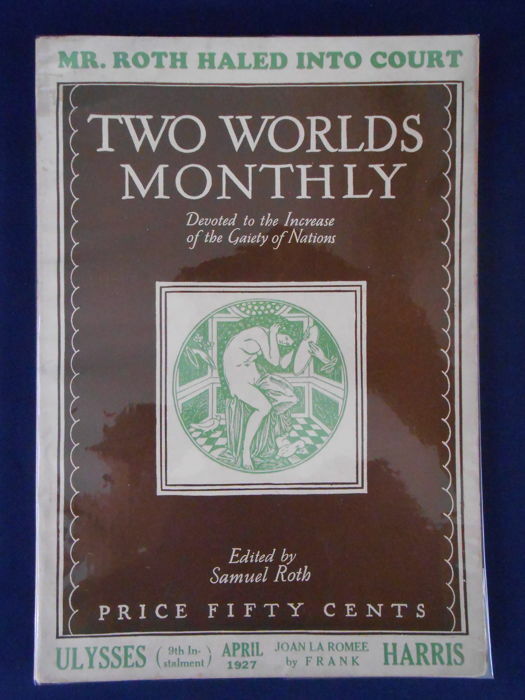 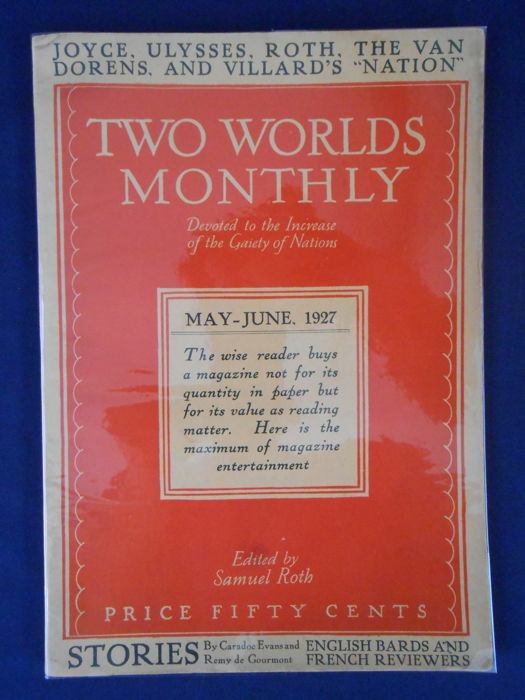 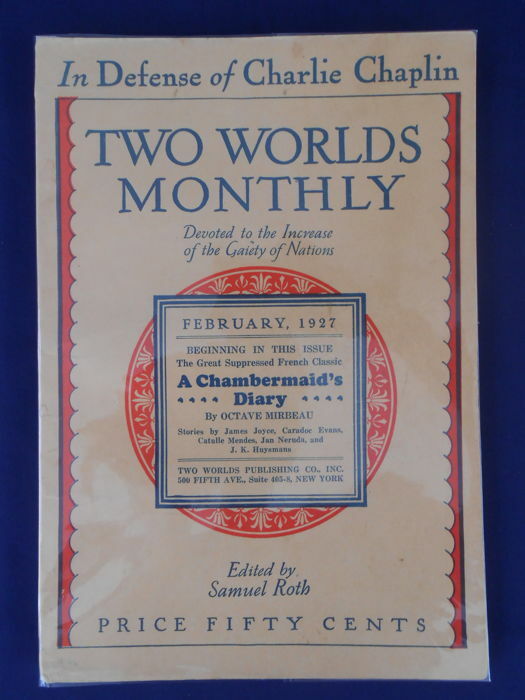 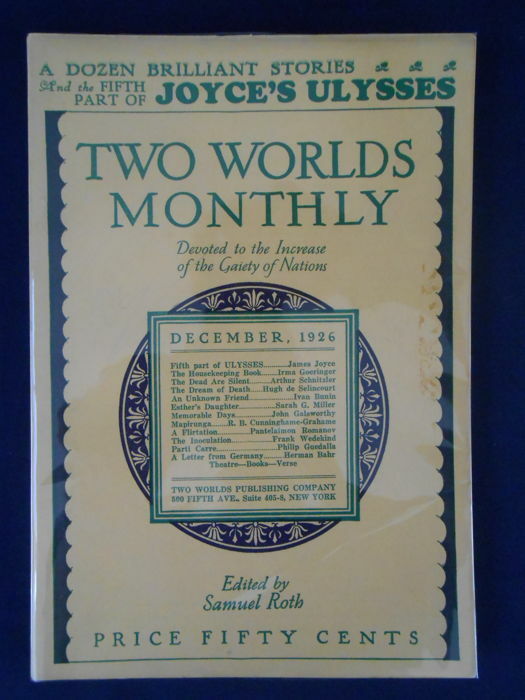 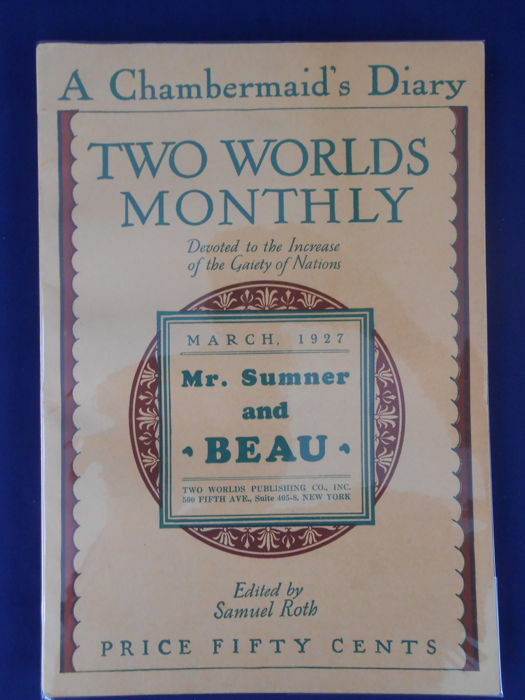 Samuel Roth "Two Worlds Publishing Company"
1st original editions Two Worlds Publishing Company, New York 1926-1927. 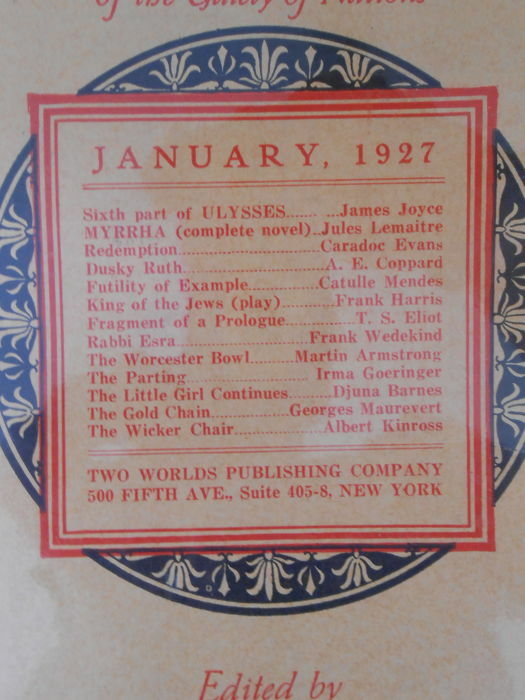 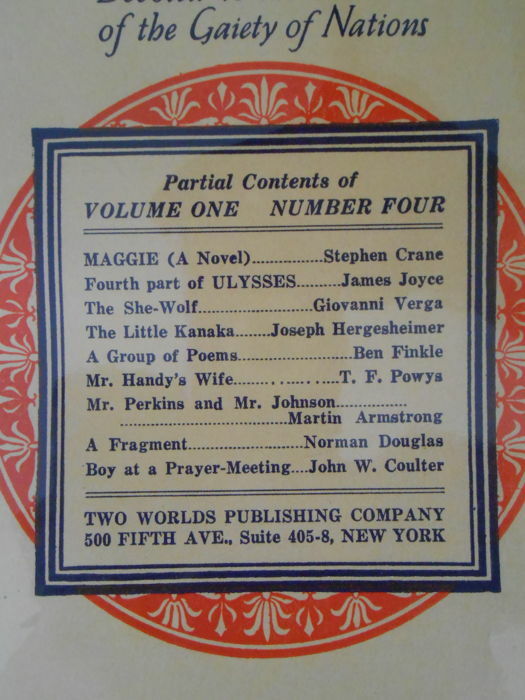 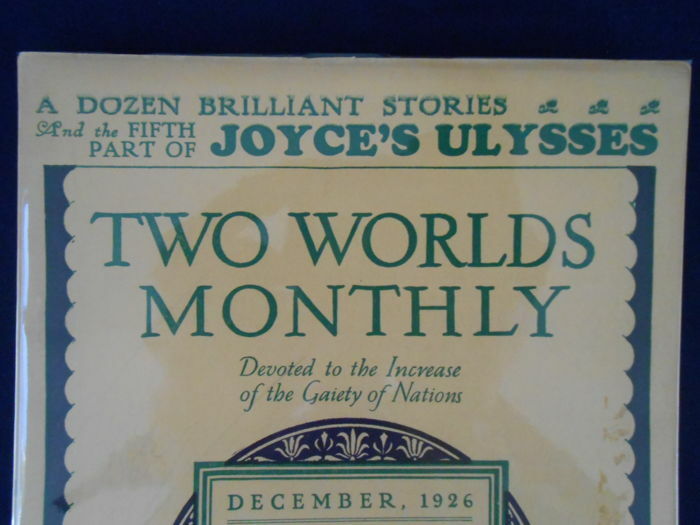 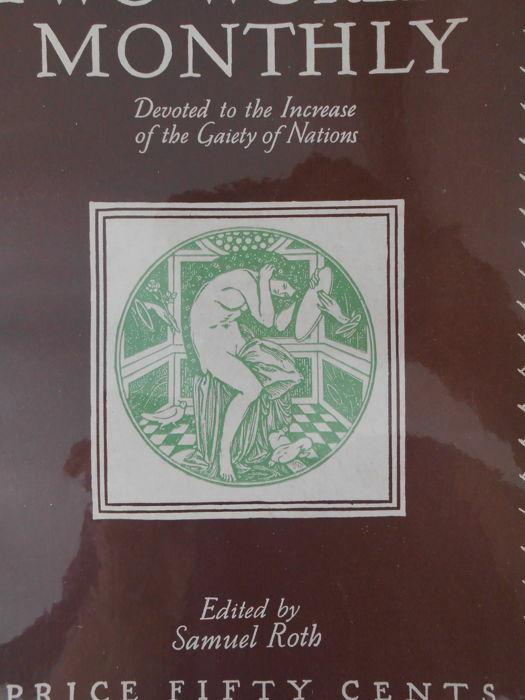 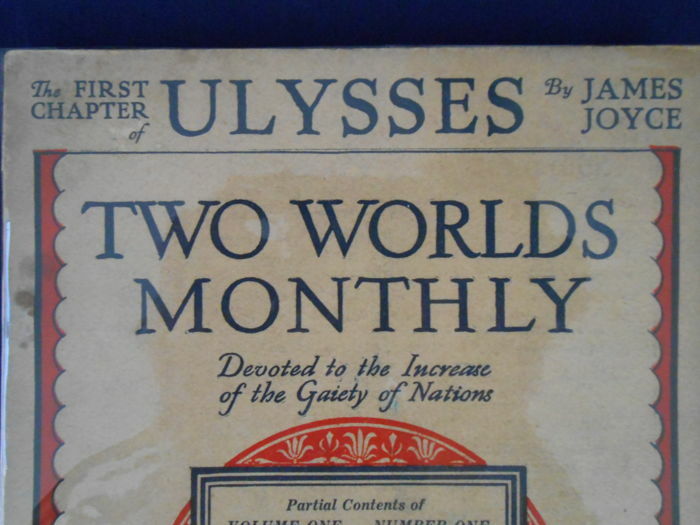 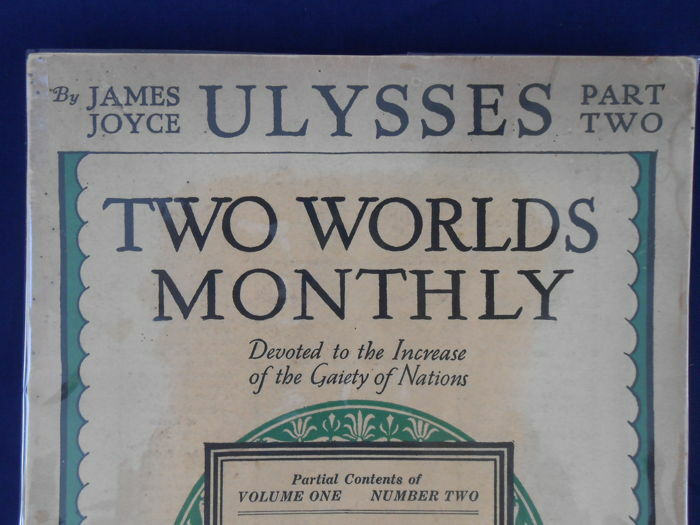 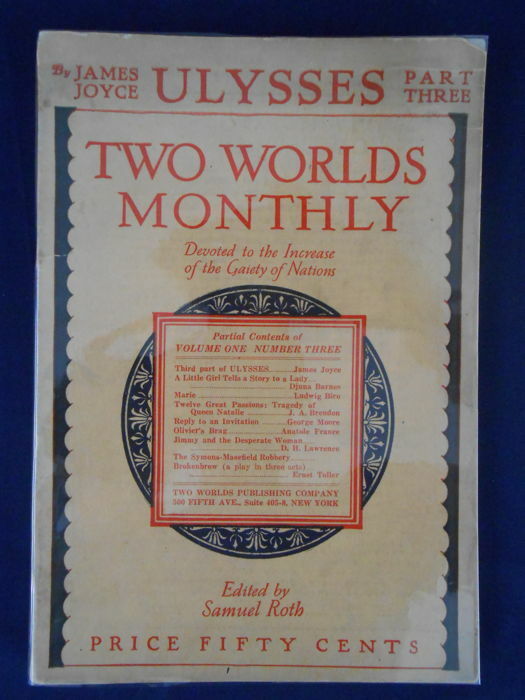 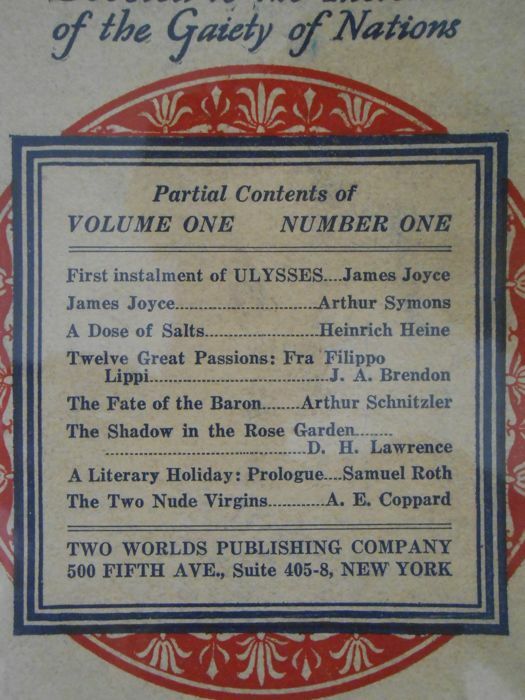 Unauthorized edition of 13 episodes from Ulysses by James Joyce contained in 11 volumes. 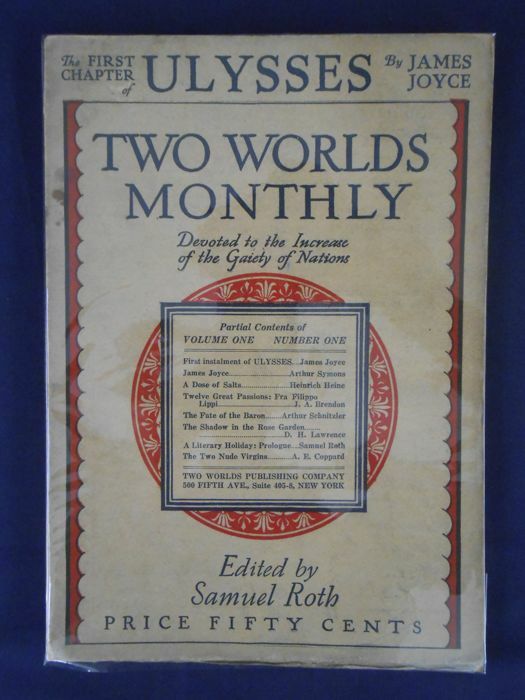 Published by Samuel Roth with the New York publishing house that bears the name of the magazine. 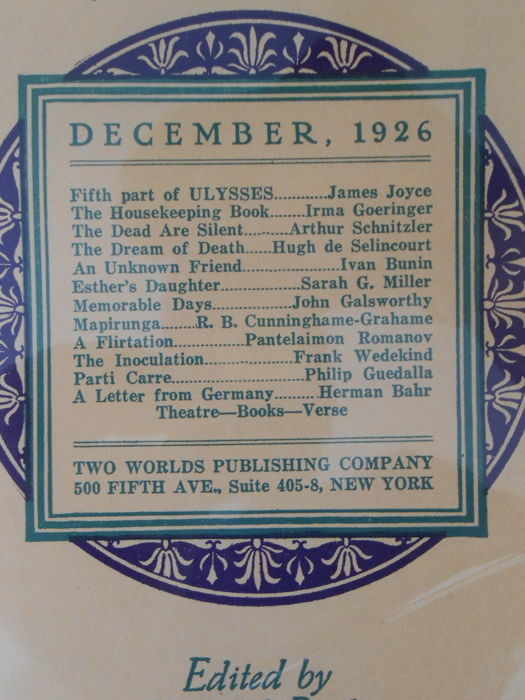 This pirated version of Ulysses provoked a considerable public outcry resulted in an international protest signed by 167 different authors-artists. 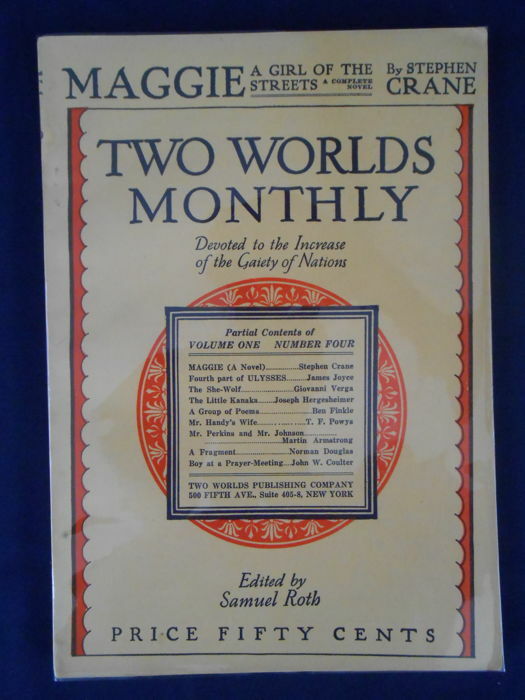 The series also contains a pirated version of Lady Chatterley's lover by David Herbert Lawrence and Maggie by Stephen Crane and other writings of many authors. 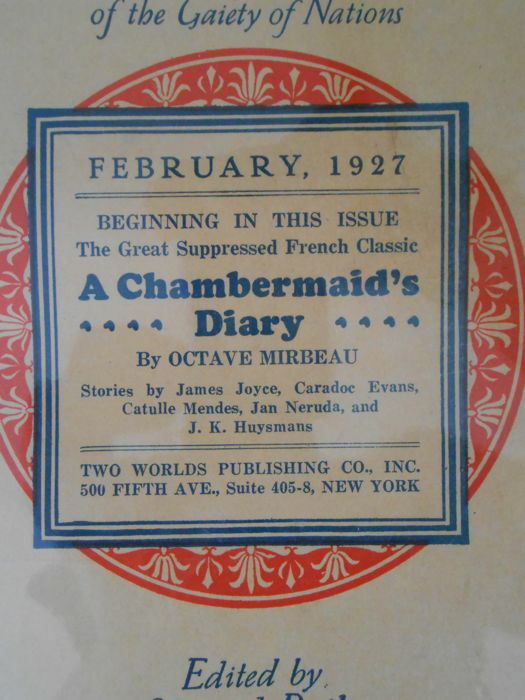 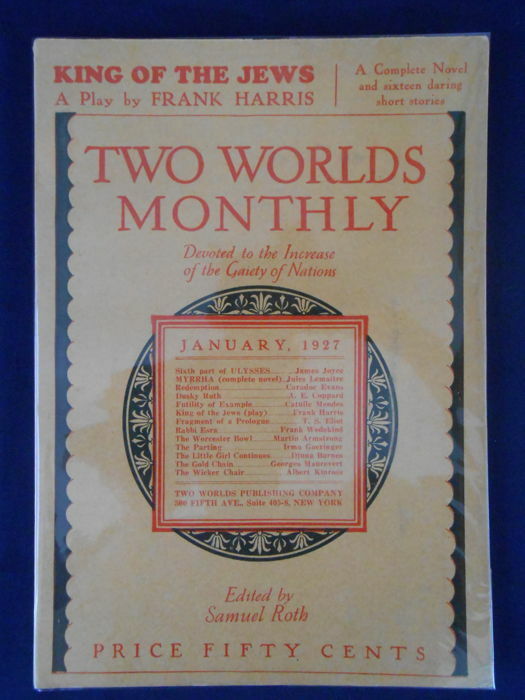 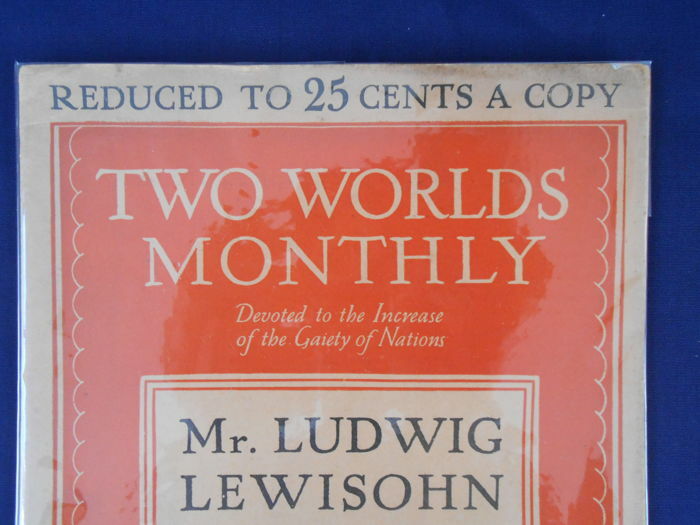 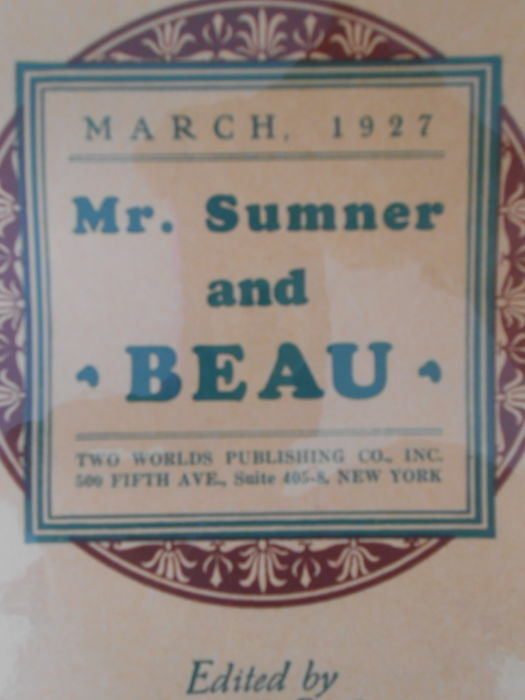 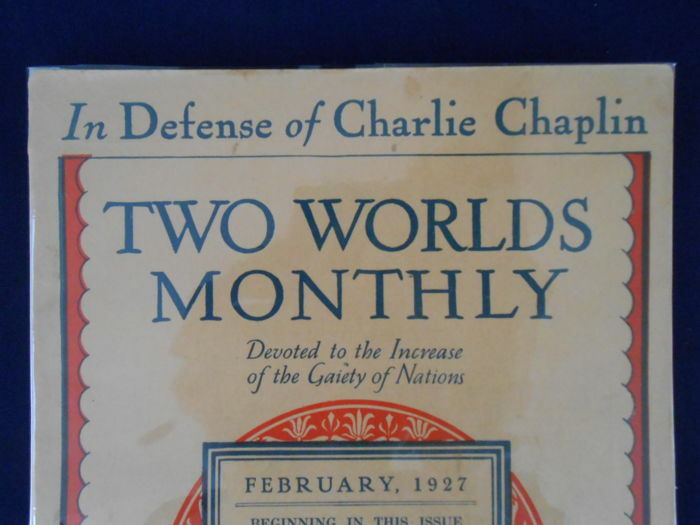 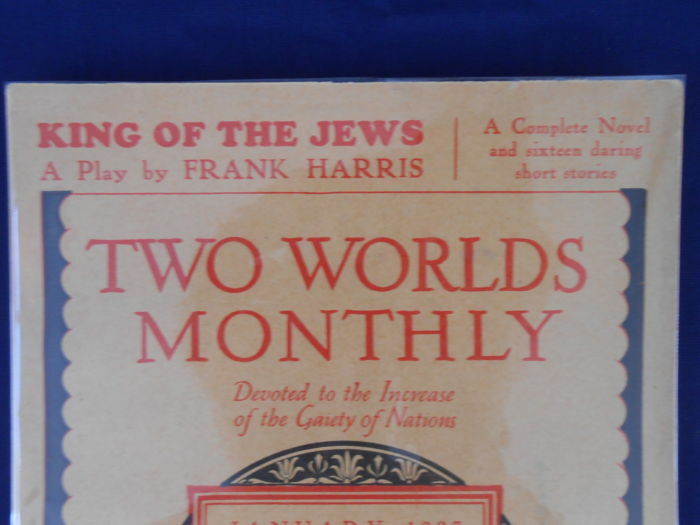 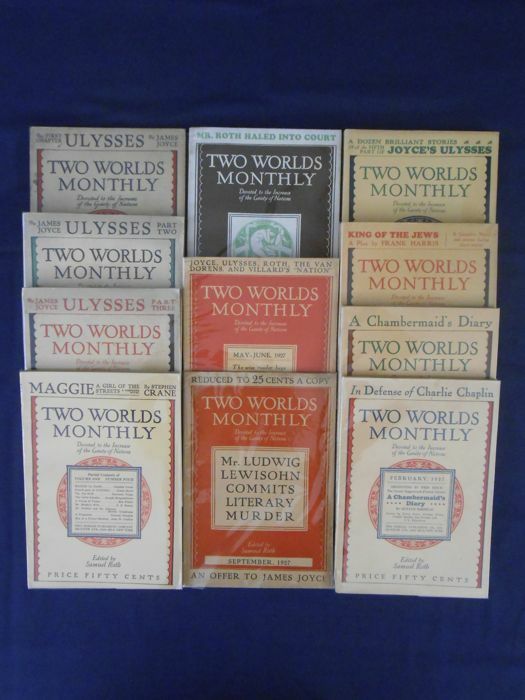 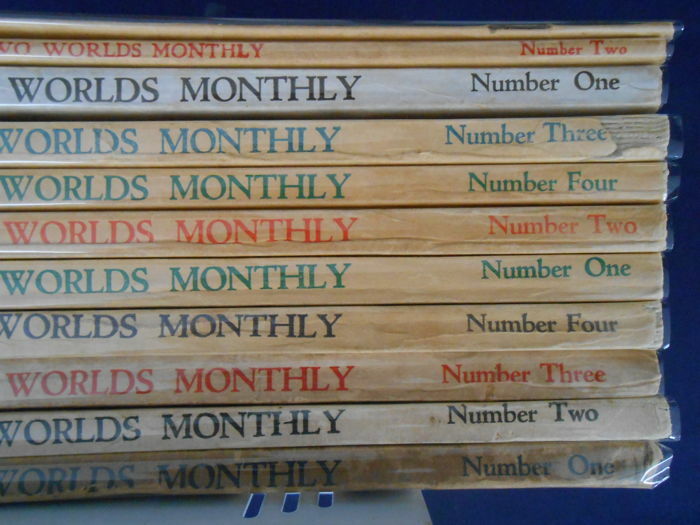 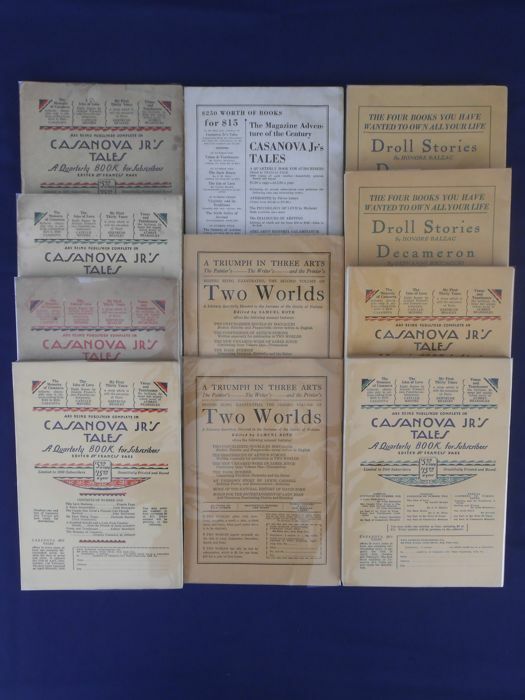 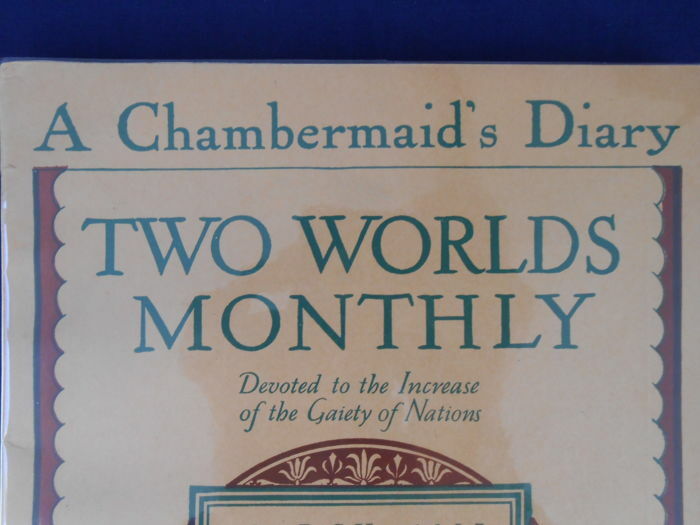 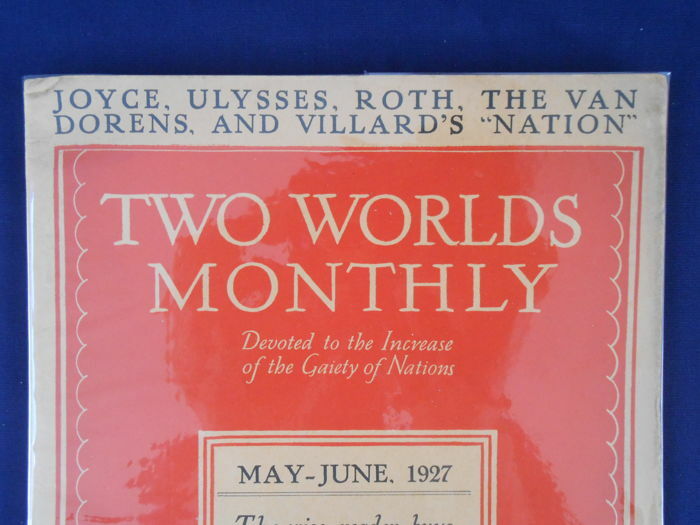 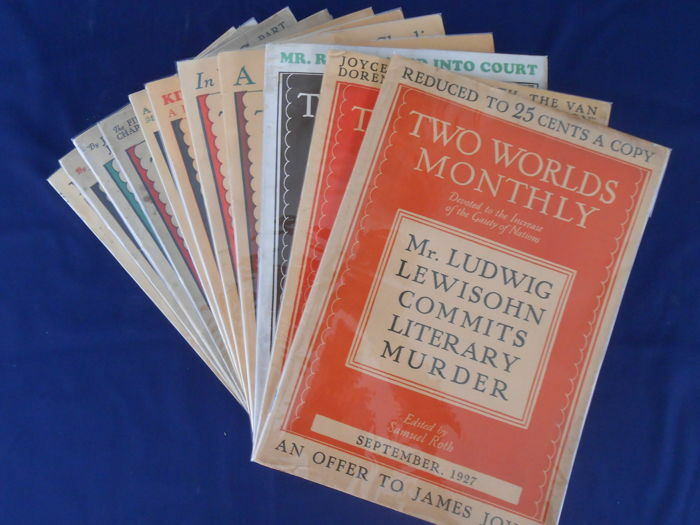 1st original editions Two Worlds Publishing Company, New York 1926-1927. 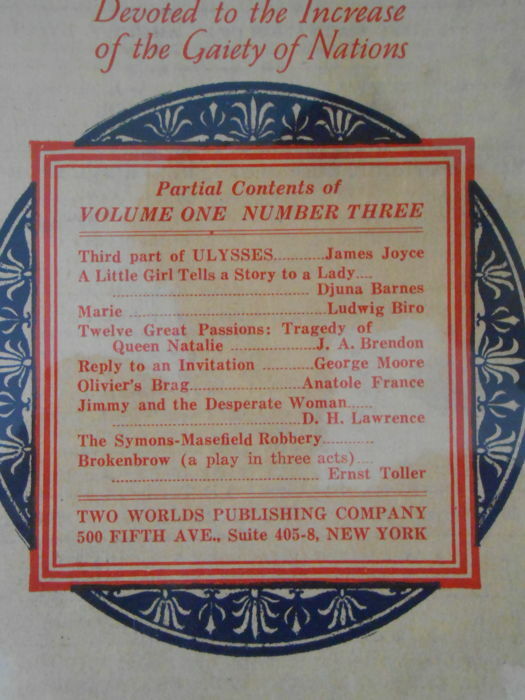 Unauthorized edition of 13 episodes from Ulysses by James Joyce contained in 11 volumes. 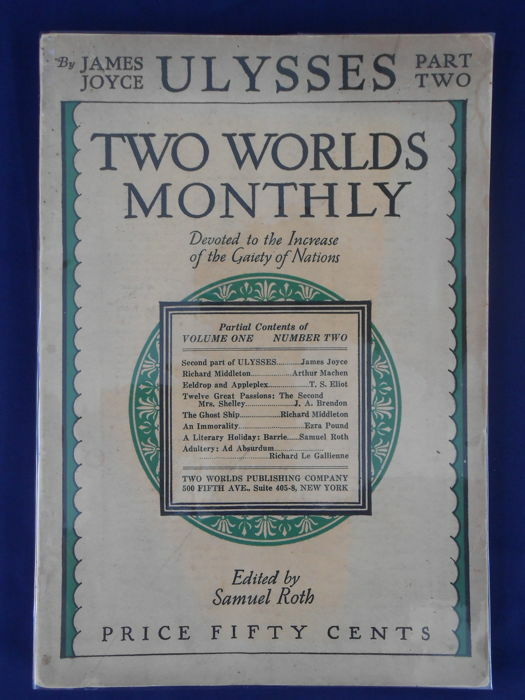 Published by Samuel Roth with the New York publishing house that bears the name of the magazine. 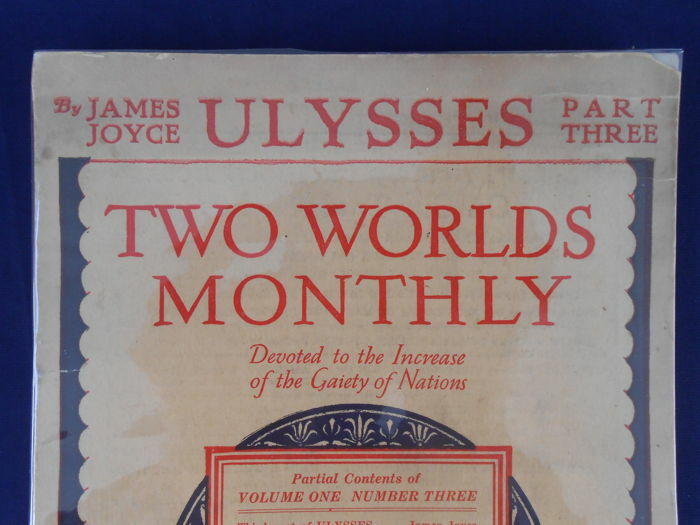 This pirated version of Ulysses provoked a considerable public outcry resulted in an international protest signed by 167 different authors-artists. 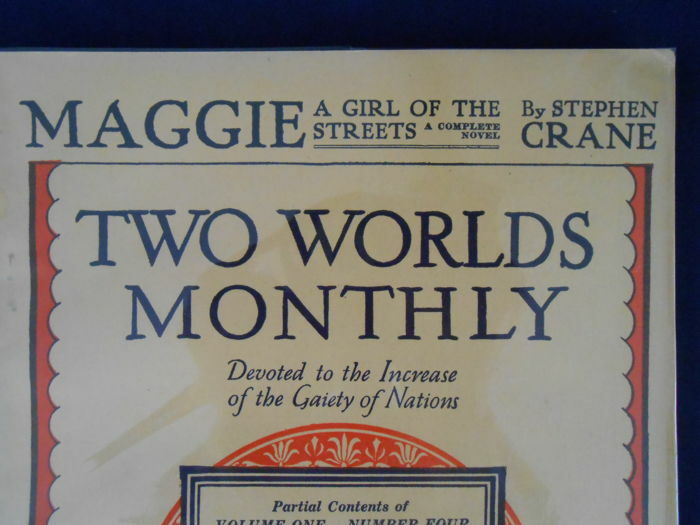 The series also contains a pirated version of Lady Chatterley's lover by David Herbert Lawrence and Maggie by Stephen Crane and other writings of many authors. 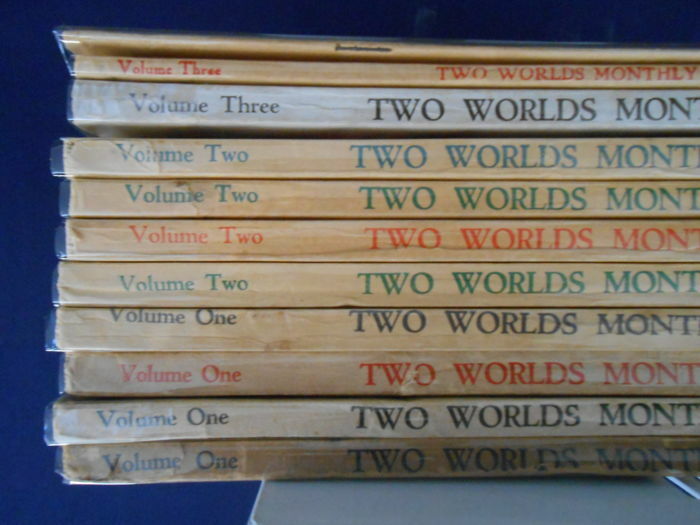 11 volumes, complete. 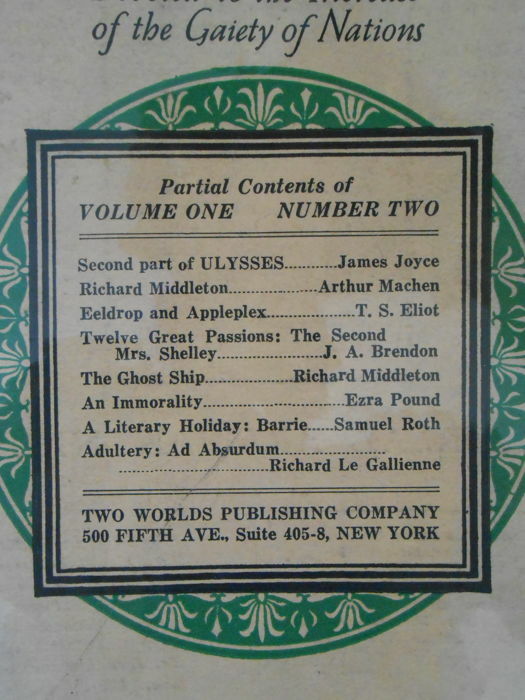 Condition: very good Slight defect on the bottom of the spine of Vol II no. 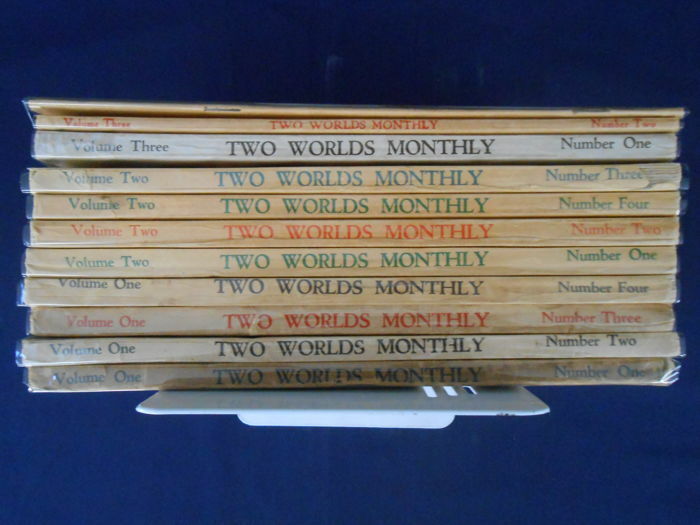 3, normal signs of wear Otherwise original paperbacks, intact and perfectly usable Very rare to find complete and in this condition English text. 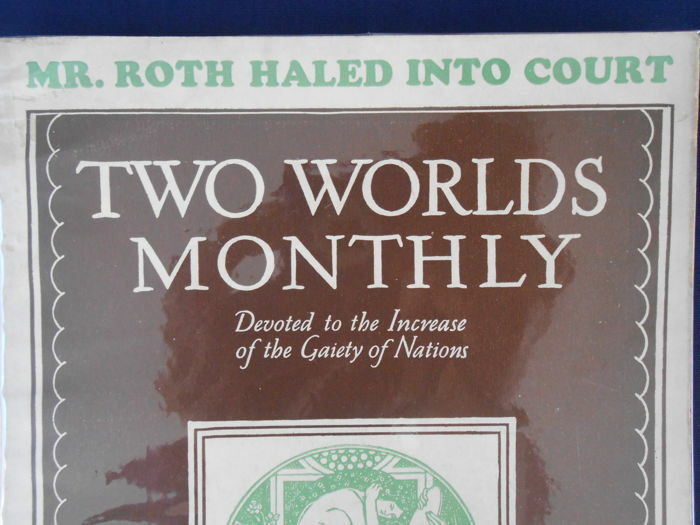 Sehr guter Ablauf! 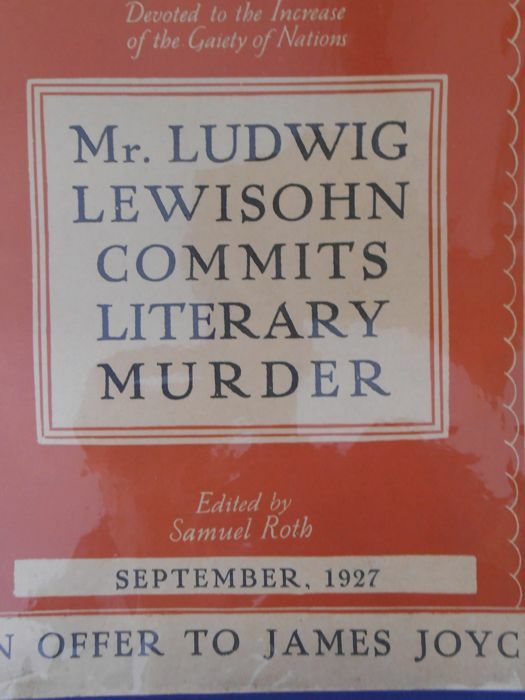 Buchbeschreibung stimmt exakt! 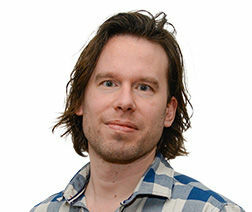 Schnelle Lieferung, bestens verpackte Ware. 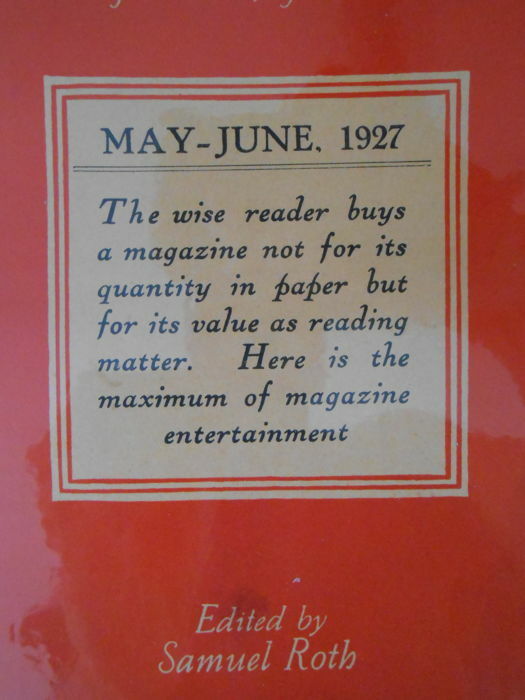 Alles prima! 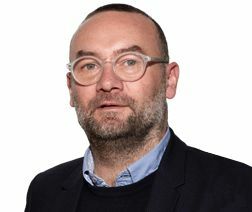 U kunt dit kavel ook ophalen bij de verkoper: Sedriano -MI- (Lombardia), Italië.